SO GRACEFUL AND SO FAST! Here's an outstanding design for a fast trailable steel cruisette with all sorts of uses, overnight accommodation for 2, cooking and toilet facilities and a generous sized cockpit. 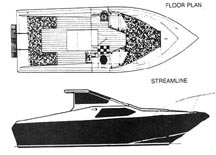 The plans include details of all 3 versions: (a) FISHERMAN with self draining cockpit for coastal operation. Headroom 6'2" pilothouse. 2 berths but no toilet or galley space. 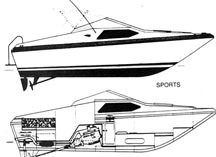 (b) SPORTS with cooking and toilet and 2 berths. 4'9" sitting headroom. (c) STREAMLINE with 6'1" headroom (max. ), galley and toilet. Self draining cockpit optional for all models. "Flashback" can tow 2 skiers. Gas motors, due to lightweight are recommended only to assure easier planing speeds. In the 23 ft. version, conventionally mounted inboards should be limited to a maximum of 800 lbs. weight and 4'3" length, including gearbox. A 145 hp should give approx. 20 knots and a 270 hp V8 around 30 knots. Other propulsions may include sterndrive, outboard or jet. Plans are available for either steel or aluminum instructions with full size patterns of frames and stem. Plans come complete with materials list, building procedure. Note - Aluminum version is available in outboard, I/O and jet drive. Steel version is available in outboard and inboard. Plans & Patterns Only $79, Was $180.